Soup has a well-deserved place in a balanced diet. If you are weight conscious, starting a meal with a bowl of soup can help fill you so you consume less calories overall. However, keep in mind that while chicken noodle soup serves as a source of essential nutrients, canned varieties of soup come loaded with sodium, which reduces its nutritional value. For healthier soup, prepare it at home using low-sodium broth and healthful ingredients. Chicken noodle soup is typically low in calories -- a cup of canned chicken noodle soup contains just 63 calories, or 3 percent of the daily allowance based on a 2,000-calorie diet. Each serving provides 7.3 grams of carbohydrates and 2.4 grams of fat -- a concentrated source of fuel for your tissues. 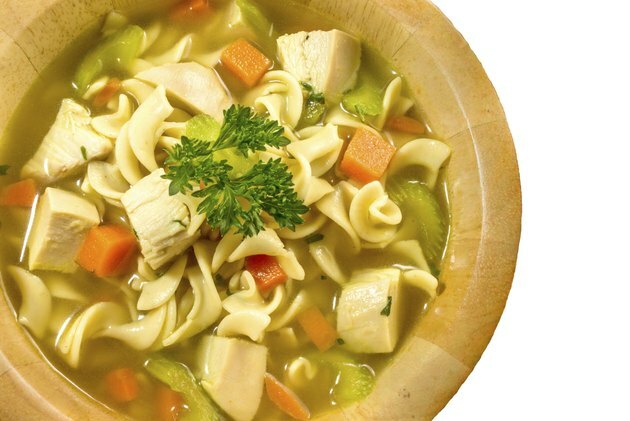 Consuming a cup of chicken noodle soup also boosts your protein intake by 3.2 grams. Your body uses this protein to maintain strong tissues, including healthy hair. Eating chicken noodle soup also boosts your micronutrient intake, and significantly boosts your vitamin A and selenium consumption. Both of these nutrients support proper thyroid gland function. Selenium also activates cancer-fighting enzymes, while vitamin A promotes new red blood cell growth. A serving of chicken noodle soup contains 498 international units of vitamin A, which is 21 percent of the recommended daily intake for women and 17 percent for men. It also provides 11.9 micrograms of selenium, which is 22 percent of your daily selenium needs. Opting for canned chicken noodle soup significantly boosts your sodium intake. Each cup of regular canned chicken noodle soup contains about 866 milligrams of sodium. The Dietary Guidelines for Americans, 2010 recommends keeping your sodium intake to no more than 2,300 milligrams per day, while the American Heart Association recommends consuming no more than 1,500 milligrams of sodium each day. Even reduced-sodium canned chicken noodle soup contains about 429 milligrams of sodium per cup. As a result, consuming canned chicken noodle soup on a regular basis can easily cause you to exceed the maximum daily recommended sodium intake. Over time, excess sodium increases your risk of heart disease and osteoporosis, and also contributes to kidney disease. In addition to reducing the sodium content of your soup by making it with low- or no-sodium chicken broth, load up your soup with veggies. Keep it classic with a mixture of sliced carrots, celery and onion, or go for an Asian-inspired chicken noodle soup by using sliced bok choy and shiitake mushrooms. Reduce your fat intake by preparing your soup using boneless, skinless chopped chicken breast, instead of fatty chicken legs, and boost the fiber content of your soup by using whole-wheat noodles in place of white pasta. Use a mixture of dried herbs and spices, such as oregano, parsley and chili pepper flakes, to impart flavor to your soup without adding salt.